Johannes Brahms (7 May 1833 - 3 April 1897) was a famous German composer. He started his career as a pianist. He was always very self-critical and destroyed any composition he thought was not really good. He thought that people were expecting him to be the “next Beethoven”, and spent many years on his first symphony before he allowed it to be performed. In the end, he wrote four symphonies altogether, as well as four concertos and a number of choral works, including a requiem. He also wrote chamber music, piano music, and German art songs, or Lieder. One of his best known songs is Wiegenlied ("cradle song"), often called "Brahms' Lullaby," which is often heard in music boxes. Brahms was born in Germany. His father was a double bass player in the Hamburg city orchestra. He probably gave the young boy his first music lessons. He soon was learning the piano with a teacher named Otto Cossel. When Brahms played in a public concert in 1843 an American agent asked him to tour America, but his teacher realized he was too young. He said that Johannes should study with Eduard Marxsen, a well-known teacher in Hamburg. By 1848 he was playing piano recitals. He also started to compose, and he sent some of his compositions to Robert Schumann to ask for his advice. Schumann sent the parcel back unopened. At this time there were many Hungarian musicians in Hamburg. Brahms liked their folk music with its unusual rhythms, little triplet figures and sense of rubato. It was to influence his own style of composition. One of the Hungarians was called Remenyi. He played the violin and Brahms often accompanied him at concerts. They went on tour together and met famous people such as the composer Franz Liszt and the violinist Joseph Joachim who became a close friend of Brahms for many years. Joachim told Brahms to go and see Schumann and his wife Clara in Düsseldorf. Schumann liked Brahms and could see that he was going to be a great composer, so he wrote an article in his music journal about him. The article had the title: Neue Bahnen (New Paths). Schumann turned out to be correct: Brahms did become a famous composer and found “new paths” (new ways of composing). Brahms remained a very close friend of Schumann. When Schumann had a nervous breakdown, Brahms went all the way to Düsseldorf to see him. Brahms soon fell in love with Clara who was 14 years older than himself. He continued to be in love with her after Robert Schumann’s death, and they had a close relationship, though Brahms became interested in other women and was briefly engaged. However, he never married. In 1859 Brahms settled in Hamburg. He founded a women’s chorus and wrote and arranged a lot of music for them. His First Piano Concerto was a great success in Hanover and Hamburg, but not in Leipzig, where a lot of people preferred the wildly Romantic music of Liszt which was quite different from Brahms’s style based on the Classical music style. Brahms decided to go to Vienna. He was to stay there for the rest of his life. In Vienna he soon made many friends who liked his music. For a short time he was director of a choir called the Vienna Singakademie, who sang some of his compositions. He met Wagner. Wagner was afraid that Brahms would start to write operas which would be more famous than his own. So Wagner wrote an article saying that Brahms was a very bad conductor. Wagner had made himself an enemy of Brahms, who never did write any operas anyway. In 1870 Brahms became director of a concert series called Vienna Gesellschaftskonzerte. He became more and more famous as a composer, but he was never very good at conducting, and in 1875 a conductor called Hans Richter took over conducting the concerts. During these years he finished one of his greatest works: Ein deutsches Requiem (A German Requiem), as well as one of his most popular works: the Variations on the St Anthony chorale (sometimes wrongly known as Variations on a Theme by Haydn). At last, in 1876, he allowed his First Symphony to be performed. It was not very successful at first, but in Vienna the audience liked it. He started to compose a lot of his greatest works and received many honours from universities. In the winter he gave concerts and in the summer he spent his time composing. He wrote his last symphony (Fourth Symphony) in 1885 and conducted it, going on tour with the orchestra through Germany and the Netherlands. From 1889 Brahms spent each summer in Ischl where he had many friends. By 1890 he had decided to stop composing, although he did still write four beautiful works for clarinet after meeting the clarinettist Richard Mühlfeld. In 1896 he wrote Four Serious Songs which were probably inspired by the sad death of Clara Schumann. The next year Brahms died from cancer in Vienna. His father had died of the same illness. Brahms wrote a great deal of vocal music. The greatest of these works is the German Requiem. There were many works for choirs, and a large collection of songs with piano accompaniment (Lieder). He wrote a lot of piano music which includes sonatas and many shorter pieces such as fantasias, rhapsodies, ballades, intermezzos, capriccios and romances. His chamber music includes string quartets, quintets and sextets and piano trios, quartets and a piano quintet. He wrote four symphonies and four concertos: two for piano, one for the violin and one for violin and cello (the Double Concerto). The German Requiem is his greatest vocal work. 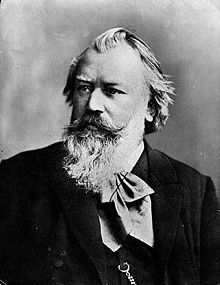 Brahms was also very interested in old music and helped to edit music by François Couperin as well as the music of his friend Robert Schumann. This page was last changed on 10 April 2018, at 19:42.